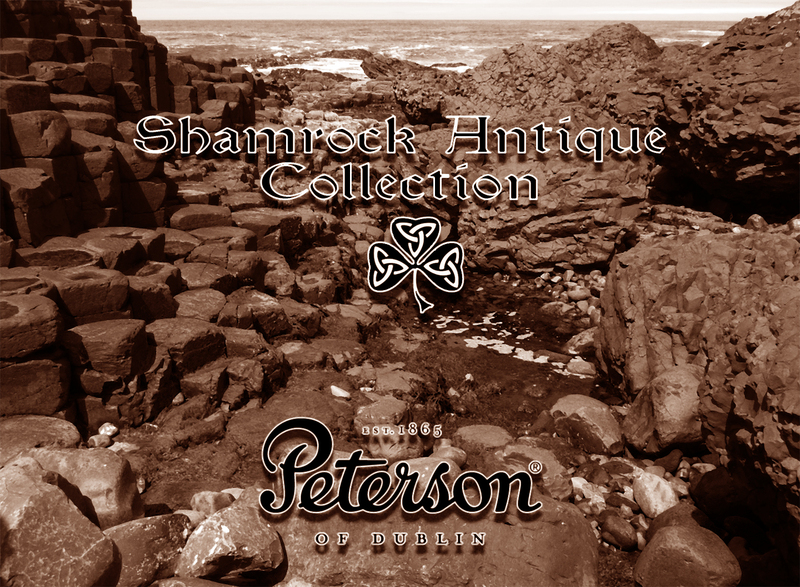 Well here it is April 1st again, and as the 2017 new lines are being packed up for their journey across the pond, it’s time to light up Peterson’s switchboards with calls about the unexpected Shamrock Antique Collection. Having taken inspiration for the 2017 Pipe of the Year from the 1906 “Jap,” Peterson jumps forty years forward to an era many aficionados love, one rich with vintage shapes, many that haven’t been in production for decades. “The idea,” says a company representative, “grew out of a chance conversation over a pint with Finn McCool.” McCool, a lecturer in religion & culture at Queen’s University, Belfast, claims his great-grandfather (a professor at Trinity College, Dublin) not only knew Heinrich Kapp (! ), but agreed to let his portrait be used for the company’s “Thinking Man” logo in exchange for a lifetime supply of Peterson Smoking Mixture and a new De Luxe System 4 every three years. “I was telling McCool about how difficult it is to come up with ideas for new collections, and McCool began talking about Bourgeault’s work on the Christian Trinity and the ‘law of three,’* which totally went over my head until he connected it with the shamrock. I confess I didn’t follow much of what he said after that, because I just kept thinking: why not take Peterson’s historical association with the shamrock and see what we could come up with?” That turned out to be a lot. The bowl shapes, of course, are the thing, and Peterson has chosen well. As those of you know who downloaded or looked at the K&P 1940 catalog (available elsewhere on the blog), the World War II era, known as “the Emergency” in Ireland, posed a number of difficulties for such a small company that depended almost entirely for its existence on exports. 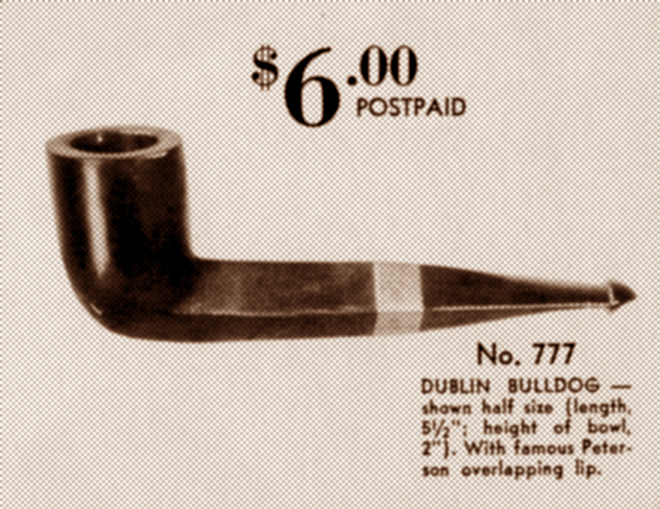 By 1943, U.S. smokers could no longer even buy Peterson pipes. But just before that temporary darkness fell, Peterson in association with Rogers Imports created two unique shapes: the “Dublin Bullog,” a diamond-shank Dublin, and a marvelous author, an unbeaded fishtail XL-version of the 999 John Bull. 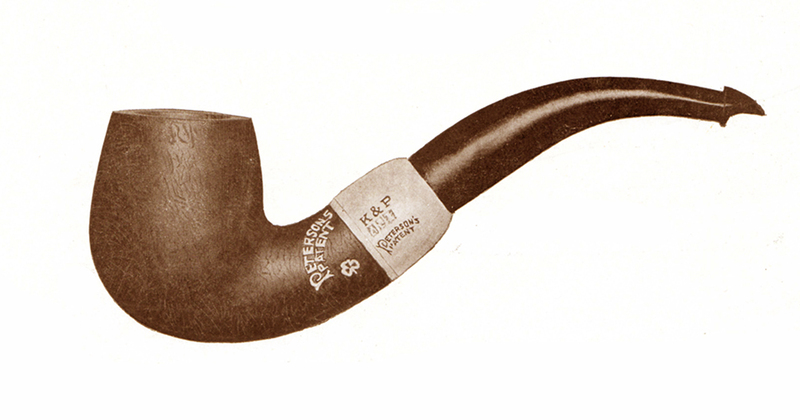 As no documented examples of either pipe has surfaced for the Peterson book, I wonder how many were actually made, or if these shapes even reached the U.S.
For their third shape, Peterson chose one that did make to the U.S., and that has met with long-standing approval, the 02 Oom Paul. This signature shape was part of regular production through the 1970s and was featured not only in the Shamrock line, but many others as well. These pipes won’t simply be reproductions, but as is Peterson’s custom, re-interpretations. For starters, all three will feature the P-Lip. But rather than a nickel band, Jason Hinch, Peterson’s innovative silversmith, is going for a sterling “Navy” mount with a soldered sterling shamrock on the top and a stamped set of shamrocks around the band. With quality P-Lip ebonite stems becoming impossible for the company to source, they have turned to an artisan maker to hand-cut the 900 mouthpieces for the 300 smooth, numbered sets, quite an undertaking in itself. As with last year’s April 1st Skellig Collection, the bowl numbers are matched, so that the same number occurs three times: 3/300 on the Dublin Bulldog, John Bull, and Oom Paul. The original shamrock stamp used on Patent-era Shamrock bowls, which still resides in the workshop, will be used as well. Retail for most sets is expected to be about $550. Natural sets will run about $750. Should be appearing in the U.S. about the same time as world peace, making summer a delight for Peterson fans all over the globe. *See Cynthia Bourgeault, The Holy Trinity and the Law of Three (Shambhala, 2013). I made it right up to “last years Skellig collection”, before I was aware of what was going on. Damn you Mark Irwin! You had me till the end. I was just researching new wheels and tires for my MGB and ready to make the buy. I saw this and thought “those old wheels don’t look that bad”, but that set sure sounds nice! Hand-cut ebonite p-lip stems, custom silver band, whats not to like! As I wrote to Steve Laug with a suggestion that he re-post this great hoax if he can — which I thought was hilarious throughout — my suspicions were piqued from the moment I read the title and date of the post, and then the bold April 1st in the opening sentence. I love the sources quoted, also, and the final sentence is the best! Thanks, Mr. B.! Coming from a man of letters such as yourself, that is high praise! Nyuck nyuck. Now I know what Sally feels like pulling that football from Charlie Brown. A man of letters! My, my! That smacks of something akin to an officer and a gentleman! But thanks for the kind note, which I accept with the same caveat! Great article as always and the April’s Day photo at the end is hilarious! Great April Fools read. Enjoy. Indeed! You sent me to my OED, where I learned about such things as “gowk’s errand” (fool’s errand) and “gowk’s-meat” (a spring gale heralding the arrival of the cukoo). Here in the States, we sometimes use “gawk” (to stare foolishly). Appropriate in context, then, given Finn McCool, Giant’s Causeway, etc.? Giants Causeway caught my attention, too, as it’s but a few miles from Ballintoy, County Antrim from which my family emigrated 170 tears ago. My highest hope is that the phone lines at Peterson’s were aflood with calls from all the right eejits in the world — and those who might just have a bad dose of Pete P.A.D. (PPAD?) — who didn’t suss your little hoax! They weren’t too happy with me last year, actually. 🙁 So I tried to be bit more obvious this time around.